Hyperthermia is elevated body temperature due to a break in thermoregulation that arises when a body produces or absorbs more heat than it dissipates. It is a sustained core temperature beyond the normal variance, usually greater than 39° C (102.2° F). Such elevations range from mild to extreme; body temperatures above 40 °C (104 °F) can be life-threatening. Hyperthermia differs from fever in that it is characterized by an uncontrolled increase in body temperature that exceeds the body’s ability to lose heat. The setting of the hypothalamic thermoregulatory center is unchanged. In contrast to fever in infections, hyperthermia does not involve pyrogenic molecules. Common cases of hyperthermia result from the combined effects of activity and salt and water deprivation in a hot environment, such as when athletes perform in extremely hot weather or when older adults avoid the use of air conditioning because of expense. Hyperthermia may transpire more quickly in persons who have endocrine-related problems; use alcohol; or take diuretics; anticholinergics; or phototoxic agents. Common forms of accidental hyperthermia include heat stroke, heat exhaustion, and heat cramps. Malignant hyperthermia is a rare reaction to common anesthetic agents such as halothane or the paralytic agent succinylcholine. Those who have this reaction, which is potentially fatal, have a genetic predisposition. Certain individuals, such as the elderly, infants and young children, the obese, outdoor workers, and those with chronic medical conditions are at increased risk for developing a heat-related illness. A thorough assessment of preoperative patients is necessary for prevention. Patient maintains body temperature below 39° C (102.2° F). Patient maintains BP and HR within normal limits. 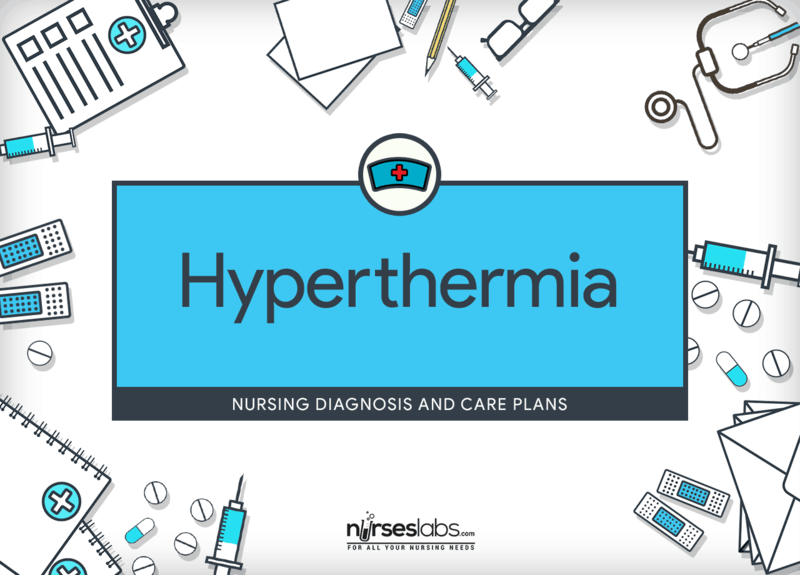 Assessment is necessary in order to identify potential problems that may have lead to Hyperthermia as well as name any episode that may occur during nursing care. Identify the triggering factors. Determination and management of the underlying cause are necessary to recovery. Monitor the patient’s HR, BP, and especially the tympanic or rectal temperature. HR and BP increase as hyperthermia progresses. Tympanic or rectal temperature gives a more accurate indication of core temperature. Determine the patient’s age and weight. Extremes of age or weight increase the risk for the inability to control body temperature. Monitor fluid intake and urine output. If the patient is unconscious, central venous pressure or pulmonary artery pressure should be measured to monitor fluid status. Fluid resuscitation may be required to correct dehydration. The patient who is significantly dehydrated is no longer able to sweat, which is necessary for evaporative cooling. Review serum electrolytes, especially serum sodium. Sodium losses occur with profuse sweating and accidental hyperthermia. Adjust and monitor environmental factors like room temperature and bed linens as indicated. Room temperature may be accustomed to near normal body temperature and blankets and linens may be adjusted as indicated to regulate temperature of the patient. Give antipyretic medications as prescribed. Antipyretic medications lower body temperature by blocking the synthesis of prostaglandins that act in the hypothalamus. Ready oxygen therapy for extreme cases. Hyperthermia increases the metabolic demand for oxygen. Provide chlorpromazine (Thorazine) and diazepam (Valium) when excessive shivering occurs. Shivering increases the metabolic rate and body temperature. Encourage ample fluid intake by mouth. If the patient is dehydrated or diaphoretic, fluid loss contributes to fever. These measures help promote cooling and lower core temperature. Alcohol cools the skin too rapidly, causing shivering. These invasive procedures are used to quickly lower core temperature. These patients require cardiopulmonary monitoring. Modify cooling measures based on the patient’s physical response. Cooling too quickly may cause shivering, which increases the use of energy calories and increases the metabolic rate to produce heat. Raise the side rails at all times. This is to ensure patient’s safety even without the presence of seizure activity. Start intravenous normal saline solutions or as indicated. Intravenous normal saline solution replenishes fluid losses during shivering chills. Provide high caloric diet or as indicated by the physician. Appropriate diet is necessary to meet the metabolic demand of the patient. Educate patient and family members about the signs and symptoms of hyperthermia and help in identifying factors related to occurrence of fever; discuss importance of increased fluid intake to avoid dehydration. Providing health teachings to the patient and family aids in coping with disease condition and could help prevent further complications of hyperthermia. Refer at-risk individuals to the Malignant Hyperthermia Association of the United States. This organization provides information and additional resources for patients who have a history of malignant hyperthermia. Discuss the significance of informing future health care providers of the malignant hyperthermia risk; recommend a medical alert bracelet or similar identification. Alternative anesthetic drugs or methods can be used for these patients.